No one will mind getting sent to the corner with the gorgeous Amish Full Two Door Corner Hutch standing there! All joking aside, this wood corner hutch comes to your home from Amish country, where it's built by hand with the materials you select. From the wood to the base style, to the interior lighting option, this wood hutch is custom made for your home. What will you use your corner hutch for? These wood storage options are versatile enough to store fine china and crystal or to house books, a home bar and more! The upper cabinet doors have wood mullions carefully cut and hand sanded to perfection. Raised panel doors show off the grain pattern of the wood you select. The two drawers are dovetailed to be the strongest and you can always rely on them. 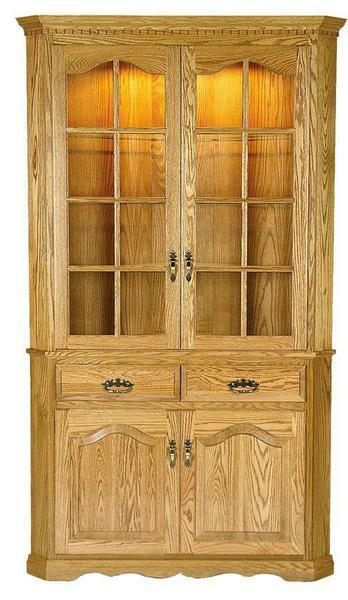 Measures 82" high, wall width of 28", front width of 34" center depth of 17"
You can have a wood corner hutch cabinet made just the way you want it--that's the beauty of custom furniture from DutchCrafters. Please email or call us today for assistance from experienced Furniture Specialists who offer a top notch customer experience to match our exquisite furniture. Thank you for shopping with DutchCrafters. Height Buffet Top to First Shelf: 11 1/3"
Thanks Jennifer! LOVE the cabinet. The workmen did an excellent job. It's just beautiful. Hi from Kentucky. My order was placed on Feb. 1, 2007 and though it took a really long time to have it delivered, I was thrilled with the craftsmanship of my corner hutch. The quality and craftsmanship of my hutch was more than I could have hoped for. My husband was a shop teacher in high school and he was in awe of the quality and perfection of the piece!